A charming mid-terraced cottage located in the heart of this popular village. Deceivingly spacious thanks to a two storey extension to the rear providing an extra bedroom and reception room. Beautiful front and rear gardens facing East and West enjoying countryside views to the front. Uplifting and exciting! THE LOCATION Located within the very heart of the village, a short stroll from amenities. Budock is a popular village lying approximately 2 miles from the harbour town of Falmouth. The village has an active community and benefits from good local amenities including a General Store, excellent Trelowarren Arms Public house, The Sanctuary Restaurant and Village Hall. The village is served by a regular bus route running to and from Falmouth and lies en-route to Mawnan Smith and the glorious Helford River with some of the loveliest coastline and countryside in Cornwall, given the prestigious label of 'Area of Outstanding Natural Beauty'. THE PROPERTY This delightful mid-terrace cottage sits in an attractive row of fine Victorian period houses with gardens to the front giving real curb appeal. The interior is very well maintained and presented, surprisingly spacious thanks to a two storey extension to the rear completed in the early 2000's. One can enjoy a cosy but well sized lounge with inglenook fireplace and multi-fuel burner, kitchen to the middle of the property and then through to a light open dining room/second reception room which opens out onto the rear patio via double opening doors. To the first floor is a double bedroom to the front, bathroom in the middle which is larger than expected and a lovely master bedroom to the rear with Juliette balcony looking out to the garden. And what a beautiful garden it is! South/West facing and tiered into the hill to provide multiple terraces and lawn areas, complete with planted beds, sheds and a pond. At the very rear of the garden is a large decked area on which sits a summer house/workshop, the perfect space to enjoy an evening looking out over the village and the countryside beyond. The house is loved by our clients but a wish to be closer to family has sparked a move and any discerning buyer has plenty to enjoy here as well - we find this cottage uplifting and exciting and we are sure you'll feel the same when viewing. LIVING ROOM 14' 2" x 11' 11" (4.32m x 3.65m) Through part glazed wooden door into the cosy lounge. UPVC sash window to front aspect with window bench, carpet, exposed beams, wall mounted lighting. The focal point of the room being a beautiful inglenook fireplace with multi-fuel burner on slate hearth, shelving storage either side of chimney in recess. 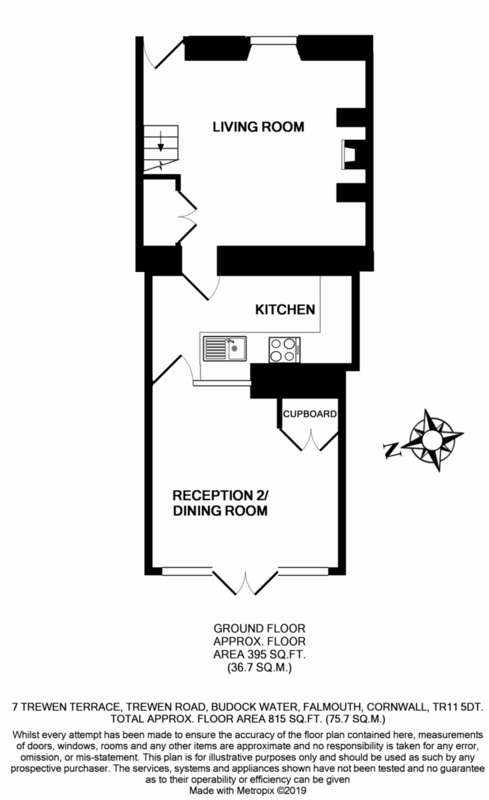 KITCHEN 12' 9" x 5' 11" (3.90m x 1.81m) Through farmhouse door to galley kitchen located between the two reception rooms. Benefiting from a lovely original multi-pane window to rear aspect and part glazed door borrowing light from the dining room, as well as a 'sun-tube' bringing in light from above. Tiled flooring, wall mounted lighting, base level units, worktop, basin, drainer, tiled splashback, electric oven and four ring induction hob, under counter space and plumbing for fridge and washing machine. DINING ROOM 11' 11" x 10' 9" (3.65m x 3.29m) The second reception room is accessed through the kitchen and located within the extension. A good sized light room with multiple windows to rear aspect and part glazed double opening doors opening to rear patio, tiled flooring, lighting, large fitted storage cupboard. STAIRS & LANDING Up open staircase from lounge with storage beneath to first floor landing, providing access to both bedrooms and bathroom. Carpet, lighting, wood paneling. BEDROOM TWO 12' 5" x 12' 0" (3.79m x 3.68m) First on the left through wooden door is bedroom two. A lovely large double bedroom with two UPVC sash windows to front aspect giving countryside views. Carpet, lighting, storage space in recess either side of chimney breast not included in the measurements. BATHROOM 10' 1" x 6' 7" (3.09m x 2.02m) Through wooden door into bathroom much larger than one would expect in a cottage with Velux window in pitched roof. Tiled laminate flooring, lighting, extractor, heated towel rail, part tiled walls, wood paneling, storage cupboards in recess. Three piece white suite comprising; low level flush WC, pedestal wash basin, bath with shower over and glazed screen. BEDROOM ONE 12' 9" x 11' 2" (3.91m x 3.42m) Located to the rear of the house and within the extension. Up steps and through wooden door to a fantastic master bedroom. Enjoying views of the rear garden from two windows and a gorgeous Juliette balcony. 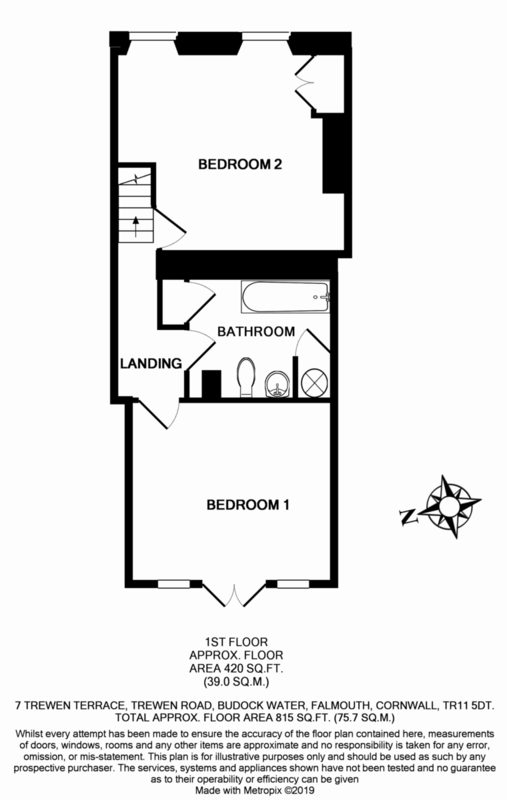 Floorboards, lighting, access to small loft space. FRONT GARDEN Access from road up two granite steps to shared pathway with neighbour leading to front door. Large well stocked planted bed enclosed with hedging and small trees, patio seating area enjoying the morning sun. REAR GARDEN A stunning well stocked rear garden tiered into the hill and facing South and West. Lower patio area directly accessed from the dining room with storage areas and outside lighting. This area rises up steps to a further terrace patio with seating space and a 6ft x 4ft shed. Rising further up steps to a lovely lawned area with planted beds and pond. To the very rear of the garden is a raised decking and a timber workshop which enjoys views back over the cottage and to the nearby countryside.